Montreal, Quebec, Canada, July 17, 2018 – MONARQUES GOLD CORPORATION (“Monarques” or the “Corporation”) (TSX.V:MQR) (OTCMKTS:MRQRF) (FRANKFURT:MR7)is pleased to report the first set of results from its 30,000-metre 2018 drilling program at the Beaufor Mine. The current results are from nine exploration holes totalling 2,047 metres of drilling on the QF1 and 1700 projects (see composite schematic section). The QF1 veins lie some 70 metres from the lower contact of Zone Q, the main zone currently in production at the Beaufor Mine. The current program aims to test the continuity of this structure over an extension of about 500 metres in the West, Central and East sectors, outside the known resource. Four holes totalling 711 metres were drilled in the West sector. 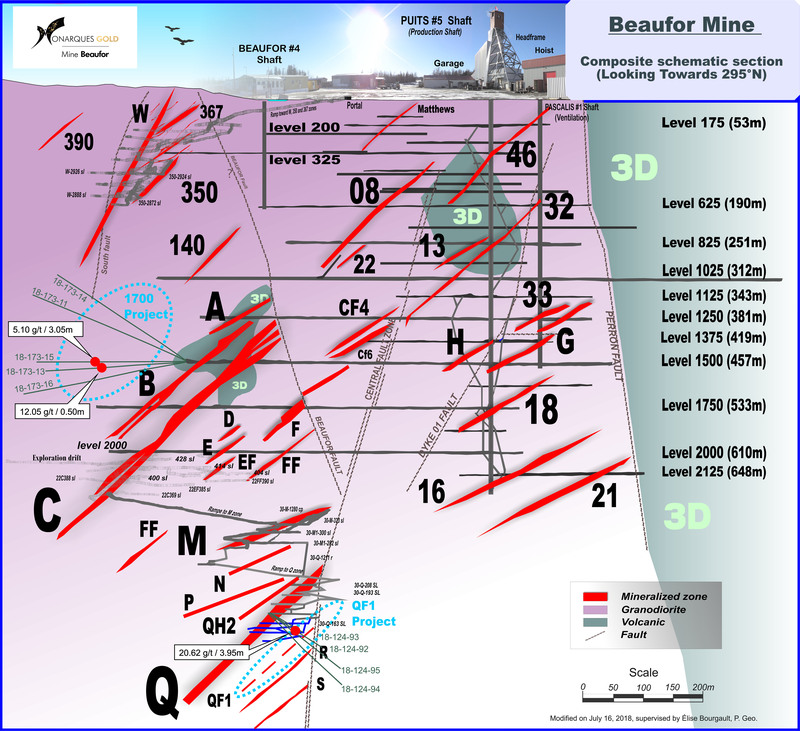 All four intersected the QF1 structure, including Hole 18-124-92, which intersected 20.62 g/t Au over 3.95 metres, including 111.00 g/t Au over 0.70 metres. This zone consists of two quartz-tourmaline veins 176 cm and 24 cm thick, containing 1% and 15% pyrite, respectively, within a chloritized, silicified, albitized granodiorite. Five holes were drilled in the 1700 project area for a total of 1,336 metres. All the holes intersected veins/veinlets and mineralization north of a major shear striking approximately 80°N. 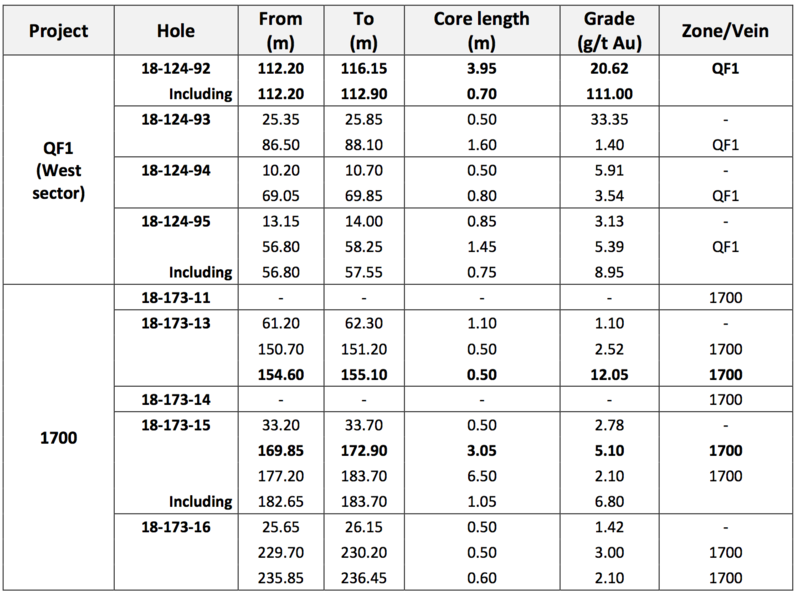 The best results were obtained in holes 18-173-13 and 18-173-15, which returned grades of 12.05 g/t Au over 0.50 metres and 5.10 g/t Au over 3.05 metres. The mineralized intersections consist of quartz-tourmaline veinlets containing trace to 5% pyrite. These holes confirm the vertical and lateral extension of a mineralized lens containing several veins and veinlets near the north contact of a shear, a structure that appears to be similar to the West Shear, known to be the main conductor for the gold at the Beaufor Mine. The western extension of the shear and the mineralized lenses is still not well understood. Sampling normally consists of sawing the core into two equal halves along its main axis and shipping one of the halves to Val-d'Or for assaying at the ALS Geochemistry laboratory, which is fully accredited under ISO 17025. The samples are crushed, pulverized and assayed by fire assay with atomic absorption finish. Results exceeding 10.0 g/t are re-assayed using the gravity method. Certified standards and blanks are inserted into the sampling stream for quality control purposes. The technical and scientific content of this press release has been reviewed and approved by Élise Bourgault, P.Geo., the Corporation’s qualified person under National Instrument 43101. QF1 : True width corresponds to 65-90% of core length. 1700: True width corresponds to 40-70% of core length.